Italian food is all about simple, fresh and seasonal choices. Multi-award winning Chef Luca Ciano has applied these three rules in his first ever cook book titled Luca’s Seasonal Journey. Growing up in Italy with the four seasons affecting his family’s eating habits, it made perfect sense for Luca to write a cook book based on these Seasons. Each season is such a special time of the year for life and food, and in this beautifully photographed book, the chapters are divided into Summer, Autumn, Winter and Spring, with each season having a personal narrative from Luca Ciano describing specific memories of why that season is so special to him. It has always been essential for Luca Ciano to think of specific food, ingredients and a cooking style applicable to every season, which is why in Luca’s Seasonal Journey the ingredients are the stars, with the delicious traditional Italian recipes working around them. 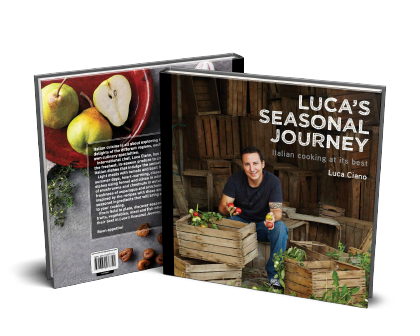 Full of appealing homemade Italian recipes to whip up for the family, as well as personal family stories, Luca’s Seasonal Journey is the perfect gift for loved ones!